How can i remove the white space in between radio buttons? I’ve been googling for the past 2 hours without finding anything, can you guys help me? There is no white space between the button and text, you have mistakenly styled the radio buttons. 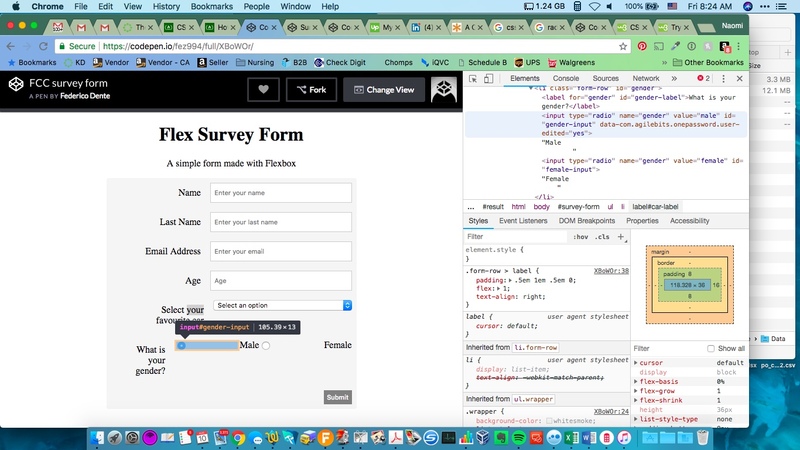 Check your .form-row > input class in css file. Here you have given theflex: 2 that is causing the radio button elements to stretch to the parent container. you need to remove that and set the format accordingly. So I’m not super familiar with flex. But its your flex properties that are causing that space. As a recommendation what I always do as I am working on the CSS of my pages. Open your page in a second tab, and go to the full page view. Then right click on an element, usually the one in question, and select inspect (in chrome) this opens the developer tools. There you can get a good visual of what CSS is actually being rendered on the element plus a visual of the margin and padding space around said elements. If you look at the screenshot I included you can see that I have a part of the html that is your radio buttons highlighted and you can see that actual space the item is taking up (in blue) and the margin space around it( salmon). I find this to be a crazy useful tool when working with my CSS. though this will not complete the challenge you still need to style the form properly. You can only get good at this if you practice it, try to understand the logic behind every property and then try to implement, in the beginning it is not going to be easy, but eventually you’ll understand it. Happy Coding!